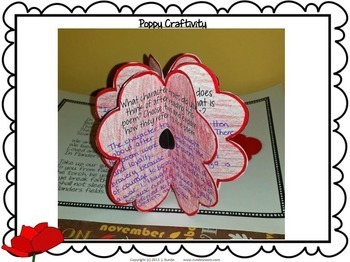 Get your students thinking about Remembrance Day in Canada or Veterans Day in the United States with this poppy craftivity. Finished craftivities make a powerful display for Remembrance Day or Veterans Day assemblies. There are two different versions of this craftivity. Version #1 has students answering general questions about veterans and the holiday. 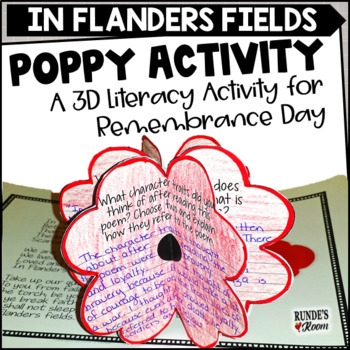 Version #2 includes a copy of the poem, “In Flanders Fields”, and has students answering questions specific to the poem. I have also included a poppy with only the answer lines so you can add your own question if you wish, and a blank poppy that you could use as a back and a cover if you wished to assemble the panels in a book instead of a 3D craftivity. 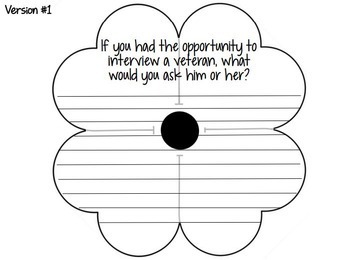 This resource contains options for two different sizes of poppies for each version – one on full sheets (great for display in a larger area and writing longer answers), and one on half sheets (great for smaller display areas and shorter answers). Print only the size you need. 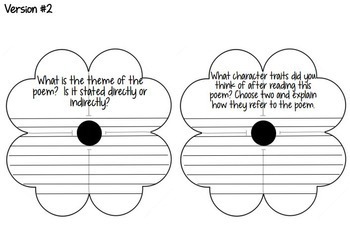 For easier completion, be sure students complete each page BEFORE they assemble the poppy. This resource is included in my Holiday Craftivity Bundle which contains 10 different holiday themed craftivities to take you through the entire year. Click HERE to see all my craftivities. Follow me on Instagram or Facebook to see more of my classroom ideas!